This is a compensated campaign in collaboration with Farmland® and Latina Bloggers Connect but all opinions are all my own. 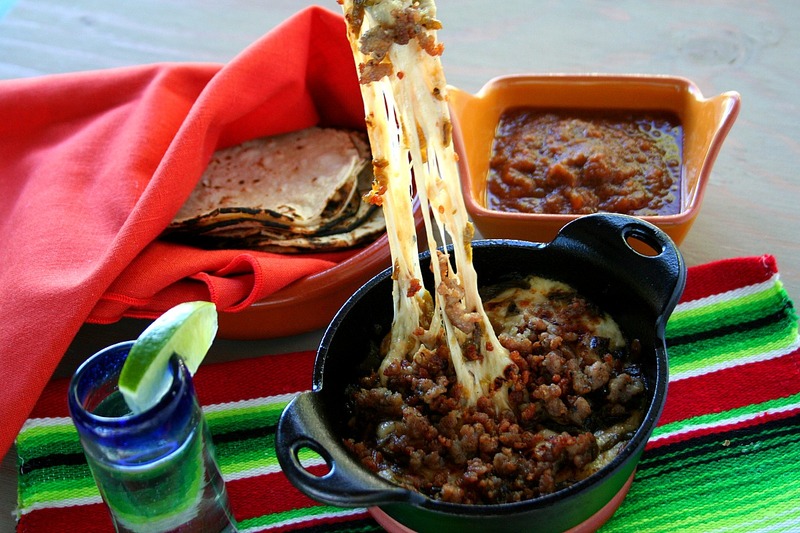 When Queso Fundido comes to the table bubbling hot, my eyes open wide and my mouth begins to water. It’s my automatic response to cheese. Top it off with crumbled pork sausage and I’m forgetting this dish is an appetizer. I am scooping up all that gooey mixture and making tacos out of it with warm corn tortillas. Dinner? What dinner? Game? What game? 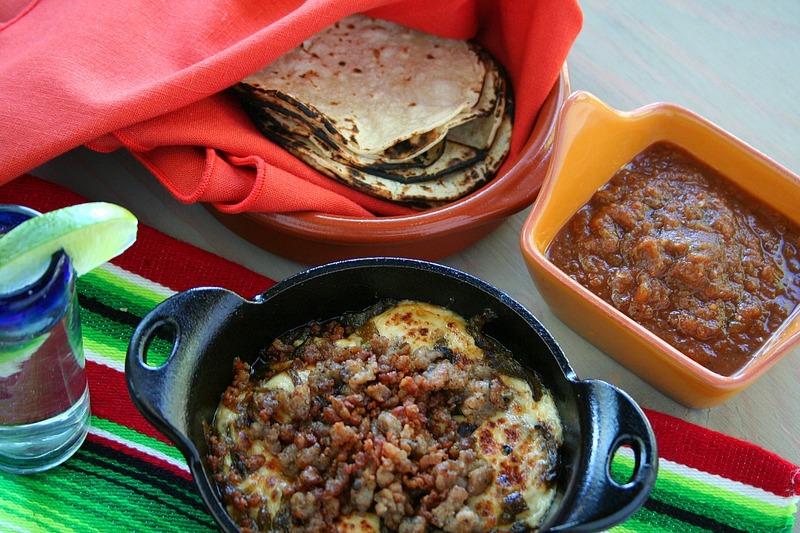 It’s the Queso Fundido that is scoring all the touch downs at my party. “Queso Fundido” translates to “molten cheese” (or “melted cheese”) and this skillet of heaven is perfect for any Big Game viewing party. 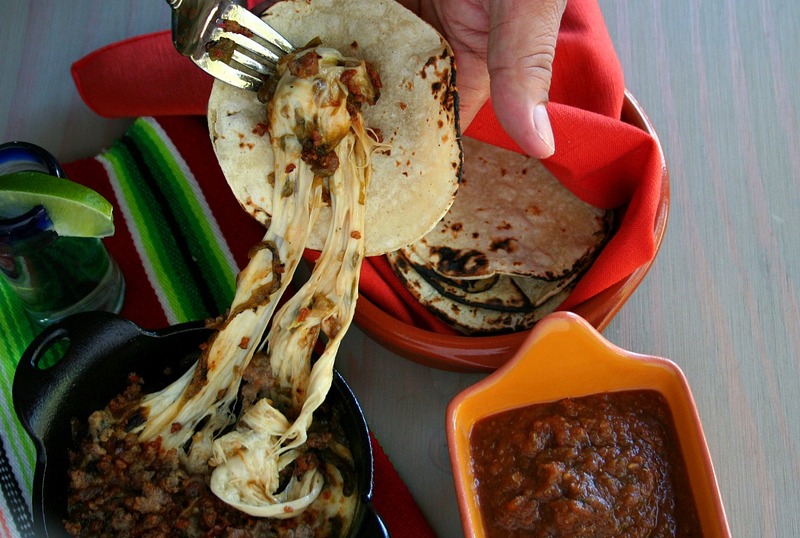 Queso fundido is also one of the more popular appetizers served in Mexico. This dish is typically made with white, mild melting cheese like queso Chihuahua, but I prepared this queso fundido with queso Oaxaca that melts nicely yet still holds some firmness, making it ideal for eating in a warm corn tortilla. Instead of the more popular added embellishment of Mexican chorizo, I swapped it out for Farmland® Homestyle Sausage. This breakfast pork sausage is gluten free with no MSG; full of the delicious all natural flavor you crave to start your day or use it to put together a quick and satisfying Super Bowl appetizer. Mixed with the melting cheese, crumbled pork sausage adds more depth and substance to this pot of mild cheese. I added some heat with rajas of roasted Hatch chiles that I have stashed in the freezer, but you can substitute any roasted green chile with heat. Now, the cooking vessel is another variable to consider. I used a small cast iron crock, which is a perfect size for two to three people. You want to make sure the queso disappears fast otherwise the cheese will start to firm up and you won’t be able to enjoy the ooey gooey cheesy mixture. You can also use a regular glass or ceramic dish. Again, the key is to serve and eat while it is piping hot. I learned there is a version of this dish in Mexico that is flambéed…using tequila! I’ll absolutely need to try that soon, but until then you can discover all of Farmland® Homestyle Sausages and keep up with them on Facebook. 1. Heat a large skillet over medium-high heat. Add the sausage and break up using a spatula or wooden spoon. Reduce the heat to medium and cook until the sausage browned. Allow to drain on paper towel. 2. Preheat your oven to 350°F. Spray your crock/baking dish with non-stick cooking spray for easier cleanup later. Me MUERO. This looks sooooo good. I’m actually swallowing so hard here because I don’t want to drool. Gracias, Laurita. Glad you enjoyed it.